From its beginning in 2006, Lovejoy ISD Athletic Department has recognized that physical activity is valuable for its own sake and that vigorous exercise is complementary to the educational principles of the district. The Lovejoy Independent School District Department of Athletics strives to compliment the educational process and to promote the Mission of Lovejoy ISD and the Graduate Profile of Lovejoy High School. Within this context for development, it is the mission of Lovejoy Athletics to offer a wide range of high quality programs that encourage and facilitate each participant to realize opportunities for championship athletic participation, physical fitness and well-being. Leopard Athletics will provide the opportunity for all student athletes to pursue and understand the values of attitude, commitment, responsibility, accountability, work ethic and team. Participation in extracurricular activities is a vital part of the total LISD educational experience and is an essential component to the well-rounded student that LISD strives to build. Student athletes should be encouraged to participate in multiple activities without sacrificing academic success. 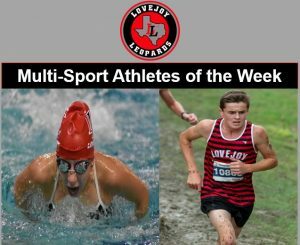 The Lovejoy Athletic Department recognizes our Multi-Sport Athletes each week with the “Female & Male Multi-Sport Athlete of the Week.” This week we recognize Charis Vela & Riley McGowan. Charis participates in Girls Swimming and Girls Wrestling, while Riley has been a member of the Boys Swimming and Cross Country programs. Both students have had many exciting experiences athletically and academically. Please take time to congratulate these two fine students for their dedication to Lovejoy High School and the Lovejoy Community. Why did you decide to participate in the sports you have chosen at Lovejoy? I have been swimming for a long time and always loved to swim so it just made sense to join the swim team. I joined wrestling because my freshman year Band would not let me be on drum line and do swim, so I joined wrestling to stay in shape. I ended up really liking it, so I continued doing it. What Life skills have you learned from being a member of Leopard Athletic Teams? I have learned many things from both sports including how far I can push myself, how to be a team player, how to persevere through difficulties, and a lot about mental toughness. I have also learned what it means to be a team and how to balance my time between school, band, swim, and wrestling. What do you like best from each sport that you participate? I have always loved swimming. I love being in the water and gliding through it. Wrestling is new and exciting to me since I’ve only been in the sport for less than two years. My favorite part about wrestling is picking people up and taking them down because in that moment I feel like I can do anything. What is your favorite academic subject at Lovejoy High School? Why? Biology is my favorite subject in high school so far. I just love learning about cells and DNA switches, and I think I would like to pursue a career in biology of some type. Who is your favorite athlete? Why? I do not have a favorite athlete because I don’t keep up with famous people. What are your plans after graduation from Lovejoy High School? I plan on attending a good college and figuring out what I really want to do with my life. What is the best part of being a Leopard Athlete? The best part about being a leopard athlete is the friends that you make at practice and the skills you learn. Why did you decide to participate in the sports you have chosen at Lovejoy? I participate in these sports because I feel a strong passion for them and enjoy working hard at them every day. What Life skills have you learned from being a member of Leopard Athletic Teams? I’ve learned that giving up is never an option. Having the willpower to keep going and to train harder every day is a very important life skill I’m learning. What do you like best from each sport that you participate? From swimming, I love the team environment, and how literally everybody on the team is so kind and encouraging to me no matter what, even if I mess up or don’t perform like I should. For Cross Country and Track, I love the workouts, because they are very fun to do with all of my teammates and they help me become strong physically and mentally. What is your favorite academic subject at Lovejoy High School? Why? My favorite subject in school is definitely math. I love it because it is so interesting to see how all of the numbers fit into complex equations and make solutions. My teachers are also always amazing and make the class very enjoyable to be in. Who is your favorite athlete? Why? My favorite athlete is probably Olympic medalist Cody Miller. I look up to him so much because he shows me that you can work really hard and achieve insane dreams, but also still have fun with it. What are your plans after graduation from Lovejoy High School? Right now, I would love to be able to run (cross country) or swim for a college team and major in econ or business. What is the best part of being a Leopard Athlete? The best part about being a Leopard athlete is the amazing team environments created by the outstanding coaches and teammates.